The Satake Hydrator is an innovative grain tempering mixer designed to provide high levels of moisture addition in a single operation. The use of vibration to provide exceptional water dispersion is combined with slow stirring and a long dwell time to ensure absorption for up to 8% moisture. Grain leaving the machine has no free surface moisture, eliminating any subsequent temper bin discharge problems. The Hydrator can be used in conjunction with a simple water flowmeter or the most sophisticated automatic moisture control system. Tests show that the Hydrator disperses water so effectively that the range of individual kernel moisture contents in a sample is less that half that of conventional tempering mixers. The angle of repose of a sample, taken immediately after the Hydrator, is significantly lower than with conventional equipment. Angle of repose is a good measure of the flow characteristics of grain, the lower the angle the more free-flowing is the material. The SHD Hydrator is an integral part of the Satake PeriTec Debranning Process. During the PeriTec Process, it is necessary to add 0.5 - 1% water prior to the Debranning Process. This moisture addition helps to lift away the bran layers. The moisture does not penetrate to the endosperm or effect the finished product moisture content. 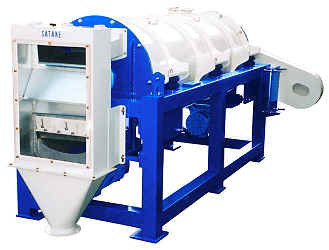 Until the Hydrator was developed, it was necessary to introduce a resting bin between the conventional Tempering Mixer and the Debranning Machine. Now, with the Hydrator's quick water penetration, it is possible to feed the Debranning Machine directly from the outlet of the Hydrator. This saves equipment and simplifies the process control system.